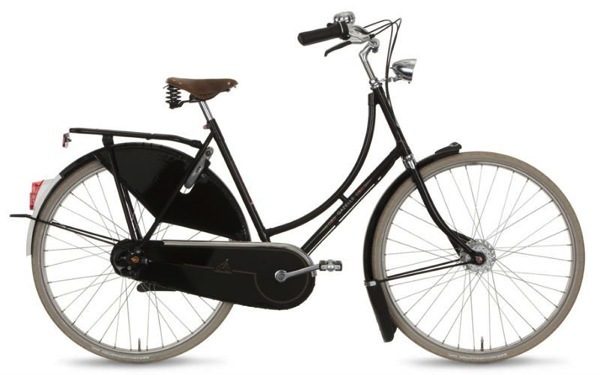 Calhoun Cycle in south Minneapolis is now stocking the Gazelle Populair which is a full-on Dutch city bike. They have both step-thru and step-over models with 8-speed Shimano internal geared rear hubs and hub dynamo’s to power the lights. It has a ring-lock (grey below the seat) that makes locking up easy (as long as you’re not in a high crime area). This is a great bike for hoping on in whatever you’re wearing for a quick ride around town, to dinner, school, the grocery store (get some panniers while you’re there for carrying lots of stuff), or along the Gateway trail. Personally I prefer Azor, Batavus, or Workcycles to Gazelle. I find the Gazelle’s to be a bit cramped feeling with the seat and handlebars a bit too close together. That’s personal preference though. From a quality standpoint I think Gazelle is likely just as good as those others and rides nicely. Note that these do not have a steering damper or even the usual attachment point for one nor do they have the usual mount on the left fork for a light when using a front rack such as a removable Steco (I believe the Gazelle front rack, which is not removable, does include a mount). These also do not include a Hebie center stand which you may want to order.